Chopsticks are a pair of sticks, usually wooden, used for eating Asian food. They originated in China sometime during the Shang dynasty (1766-1122 B.C. ). As Chinese culture spread, chopsticks were introduced to other countries, and quickly became common across Asia. The English term chopsticks apparently is derived from the Pidgin English spoken in British Chinese colonies. A Chinese term, kuai-tzu, or quick ones became chop (Pidgin for quick) sticks. Much lore surrounds chopsticks, especially in Japan. Their use is said to promote a child's intellectual development, and at home each member of the family has his or her own pair of chopsticks which are suited to his or her hand size. Many taboos govern the use of chopsticks. For instance, the two sticks must not be grasped in one fist or laid across a bowl. It is also forbidden to stab food with chopsticks, to lick the tips, or to beat on a plate or bowl with them to get someone's attention. The shape, size, and material of chopsticks indicate specialized uses. Chopsticks for personal use may be quite ornate and beautiful, hand carved, inlaid, and coated with lacquer in traditional patterns. Plain, long wooden chopsticks with blunt tips are used for cooking. For eating out, Asian restaurants provide disposable single-use chopsticks made of light wood. There are even special long chopsticks used only for cleaning out cat litter boxes in Japan. The sticks worn in the hair of Japanese Samurai warriors in pre-modern times were apparently used for grasping the severed head of a vanquished enemy. The most prevalent material used to make chopsticks is aspen wood. Aspen is used to make the disposable chopsticks used in restaurants. About 20-billion pair are used yearly, mostly in Japan. Many other materials are used to make chopsticks designed for more than one use. Metal chopsticks are common in some areas, and elaborate chop-sticks may be carved of precious materials such as ivory or jade. Most chopsticks are made of some variety of wood, and coated with oil, paint, or lacquer. Some varieties of chopstick wood have superstitions related to them. Chestnut chopsticks are said to bring wealth, black persimmon chopsticks, long life. Other typical woods used for chop-sticks are pine, cedar, cherry, sandalwood, and paulownia. A traditional Japanese material is a sandwich of thin boards of maple, pine, and cedar called shuboku wood. In general, the wood used needs to be relatively hard and impervious to water. The color and grain of the wood is also important for fine quality chopsticks. 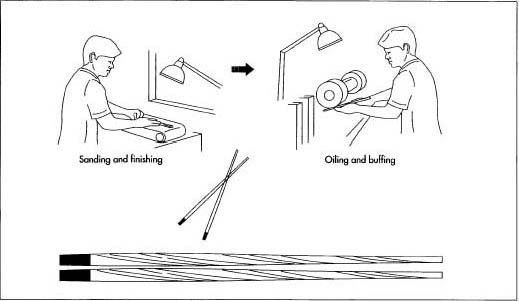 This is the process for fine quality, hand-crafted chopsticks. grain in it. Then the maker mills the wood on a bandsaw, cutting it into a smooth rectangular block just longer than the finished sticks and with the width of several pairs. 2 If the wood is to be inlaid with a contrasting wood, this happens next. The inlay provides an interesting pattern to the finished stick. The maker cuts a trench in the milled block. Then the maker glues a thin sheet of the contrasting wood in the trench. The maker clamps the inlay to the block and lets it dry. 3 After the inlaid wood is completely dry and secure, the chopstick maker cuts blanks. The blanks are wood pieces that are roughly the length of the finished chopstick, and about 0.25 in (0.64 cm) wide. Using a table saw, the maker cuts the milled block of wood into a number of blanks, one for each finished chopstick. They come out as long, thin rectangles. 4 The rectangular blanks must next be shaped. This can be done with hand tools or mechanically. The shape of the chopstick varies according to what the maker or customer desires. Some chopsticks are square at the end, tapering to a cylindrical point, and others are cylindrical overall. The degree of taper is also a matter of discretion. The maker shapes the sticks using a handheld scraper or holds them against the belt of a sanding machine. 5 After shaping, the chopsticks need to be made smooth, so that they don't splinter in the mouth of the user. Handmade chopsticks are sanded very carefully, using several grades of sandpaper. Now they are ready for finishing with oil, paint, or lacquer. 6 Some chopsticks will be dipped in lacquer at this point. Lacquer is a natural substance made from the sap of a variety of sumac. It is nontoxic, and has long been used as a decorative wood finish in Japan and China. There are several traditional styles of chopstick lacquering in Japan, with distinctive patterns belonging to different traditional schools. The chopsticks are dipped in the liquid lacquer and hung to dry until the finish is clear and hard. The chopsticks may also simply be dipped in nontoxic paint. Fine wooden chopsticks are often finished with oil, which gives them a soft polish and brings out the beauty of the wood grain. The oil may be applied with a soft cloth, and then the maker buffs the chopsticks either by hand or by holding them against the wheel of a mechanical buffer. Mass-produced chopsticks, especially the disposable kind, are made rapidly in a fully automated process. Aspen wood is harvested, and the finest grade wood selected. This wood is fed into a mill, which cuts it into blocks. 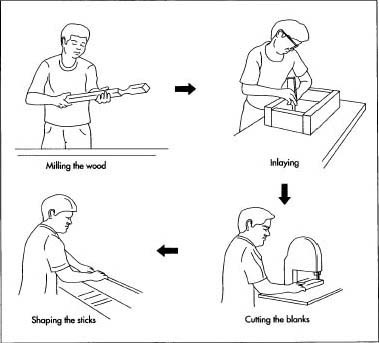 This process typically happens at the site where the wood is grown. Then the aspen blocks are exported to the country where they will be used. The blanks are cut, sanded, and finished at a chopstick factory, which may churn out millions of pairs a year. Disposable chopsticks are typically "half-split." That is, the two halves of the chopstick pair are only half separated, and they are only snapped apart when ready to be used. So the blank in this case is actually for the pair of chopsticks, not the individual sticks. The quality of the wood is very important to how well a chopstick will wear. Fine makers inspect the wood carefully before beginning, and are able to observe it throughout the manufacturing process. The maker picks the wood for a pleasing color and grain, and strives to bring out these characteristics in the shaping and finishing. The disposable chopstick industry has been accused of exceedingly wasteful foresting practices. Because only very fine-grained wood is suitable for chopsticks, only some trees, or only parts of some trees, can be forested. In some cases, the forest is clear-cut, though only one quarter of the wood is then fed into the chopstick mill. The remaining lumber is left to rot or burn. The bulk of disposable chopsticks are sold in Japan, where using someone else's chopsticks is considered disagreeable. Restaurants almost always provide their customers with one-use chopsticks, but because of environmental concerns, some Japanese consumers are foregoing disposable chopsticks. Some corporations are providing their workers with reusable plastic chopsticks in company lunchrooms. Another replacement product growing in popularity is disposable chopsticks that are made only from wood obtained from forest thinning. This is supposed to represent wood that would otherwise be wasted, so the product is environmentally sound. Consumer boycotts and voiced concerns have already made disposable chopsticks a prominent environmental issue. Faced with growing opposition to their wasteful practices, chopstick manufacturers may be forced to come up with alternative. Amaury, Saint-Gilles. Mingei: Japan's Enduring Folk Arts. Boston: C.E. Tuttle, 1989. "Chopped Chopsticks." The Economist (August 4,1990): 56. Karliner, Joshua. "God's Little Chopsticks." Mother Jones (September 1994): 16. It is better if can discribe more details on mass production of chopsticks, including machines,where they are available,Prices of the machines and web sites of detailes available.